Just type in the search field and a list of suggestions will pop-up with relevant terms. Figure 1. 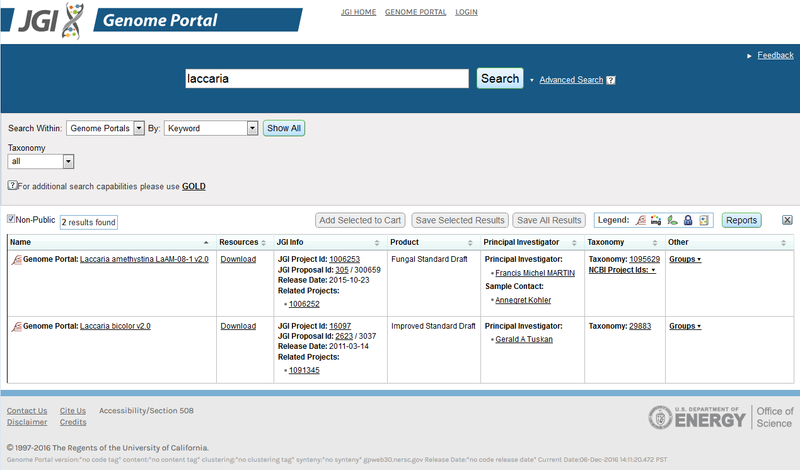 Image shows the search results within Genome Portals by keyword "laccaria"
Organism Names link to corresponding Genome Portal resources. Links might represent the connections to MycoCosm, IMG and Phytozome genomes. Click on a JGI Project Id link to go to the corresponding project. Click on a Principal Investigator name to e-mail the P.I. for this project. Taxonomy info items are linked to the NCBI Taxonomy Browser.